Healer Blackthorn and her companion Grim seek to help a noblewoman with an eerie problem. It is obvious there is more to Lady Geiléis’ story than first appears, but can Blackthorn overcome her need for vengeance of past wrongs to uncover the answer before it’s too late? The second instalment of the Blackthorn and Grim series, this could certainly be read as a standalone. The two main characters continue to grow and address their turbulent pasts, but a reader new to the work would comfortably pick up the backstory, as Marillier does an excellent job of seeding relevant information along the way. The prickly Blackthorn and the taciturn Grim continue to fascinate, and learning about them through their actions and the events going on around them is delightful, if heart-wrenching. Marillier has a gift for writing beautiful prose that makes you want to drown in the words. It’s lyrical and lovely, adding significantly to the feel of the world-building while never detracting from the action or indeed the characters, who are not always beautiful, but never dull. 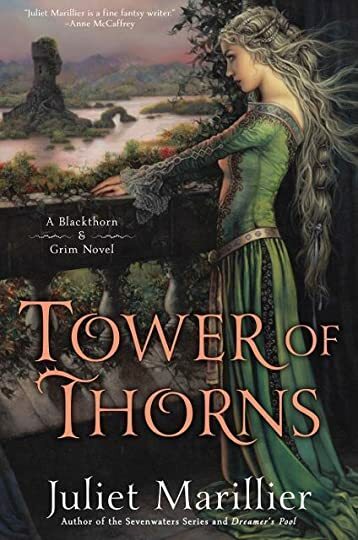 Tower of Thorns ends wonderfully, a fully encapsulated story with a finite finish, leaving the reader desperate to read the next book, yet not completely bereft and left in limbo until then.